Region Two residents can expect an improved supply of water as the Guyana Water Incorporated (GWI) moves to upgrade its service in the region. The Government Information Agency (GINA) reported on Tuesday that the water company has several initiatives underway geared at ensuring all communities in Essequibo receive adequate potable water. Project Coordinator, GWI, Region Two, Rabindra Deonarine said one of those plans includes the construction of another water treatment plant to complement the operations of the Lima Sands plant. Deonarine explained that this initiative is one of the company’s long-term plans. He said GWI is currently formulating its strategic plan and once completed, the company will decide on the year to embark on the project. The new water treatment plant will serve the northern section of the coast from Paradise to Charity. During this month, GWI will commence the metering of the entire Essequibo coast. This should be completed by the end of 2017. The project is aimed at reducing losses and bettering the pressure of water distributed. In the meantime, the company is working to improve the quality of water distributed from the various pump stations, which is plagued with a high iron content. “The average iron content from the ground water in Essequibo is 5 milligrams per litre so what we did, commencing 2017, was to introduce a sequence treatment at all the pump stations. This treatment is to improve the quality of water. So customers are now receiving water of a better colour with no stains on their tiles, toilets etc. Customer satisfaction has increased in the region,” Deonarine explained. The water company currently serves 9,200 customers with one water treatment plant at Lima Sands and six pump stations across the region. 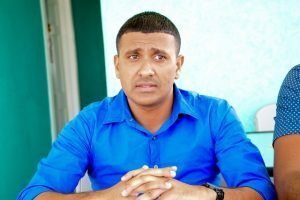 Deonarine pointed out that the Lima Sands water treatment plant is not functioning because it is awaiting on the Guyana Power and Light Incorporation to power the pump station and for service connections to be installed in the area. In the meantime, residents of Lima Sands are being encouraged to apply for the metered water service in their community.